In late March, the state budget agreement announced includes provisions that allow ride-sharing companies, such as Uber and Lyft to operate in upstate New York. The ride-sharing industry will be regulated by the state Department of Motor Vehicles and there will be licensing requirements in place for these companies. Local government officials in all counties and cities with at least 100,000 people will have the option to allow ride-sharing or not in their communities. Uber and other ride-sharing companies will be required to have a minimum group insurance policy of $1.25 million for drivers who provide rides in New York. Workers’ compensation coverage will be provided to drivers through the Black Car Fund. Background checks will be thoroughly conducted on drivers employed by these ride-sharing companies. There will be a zero-tolerance policy in place for alcohol and drug use. And anti-discrimination protections will be in effect. But when will ride-sharing be expected to be available in upstate New York? The ride-sharing provisions in the budget will take effect in 90 days, which means the earliest Uber, Lyft and other companies would be able to begin providing service is in early July. We encourage Greene County residents to do what they can to help increase awareness about ride-sharing coming to upstate New York! That not only includes spreading awareness to consumers who would use the service, but encouraging friends and family to become employees of these ride-sharing companies! 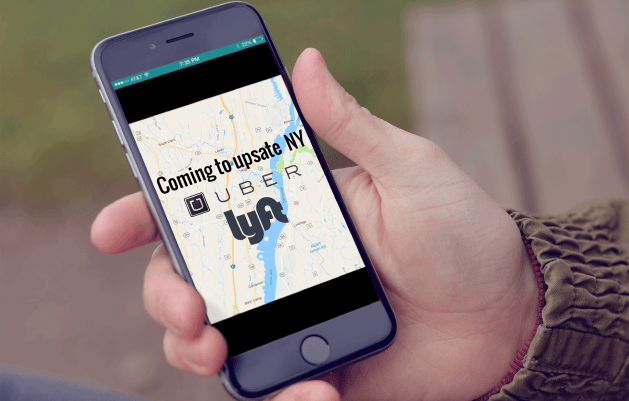 Click here to find out how to become an Uber or Lyft driver in upstate New York.